The US Geological Survey Pliocene Research, Interpretation and SynopticMapping (PRISM)NorthAtlantic faunal data set provides a unique, temporally constrained perspective to document and evaluate the quantitative geographic distribution of key mid-Pliocene taxa. Planktic foraminifer census data fromwithin the PRISMtime slab (3.29 to 2.97 Ma) at thirteen sites in the North Atlantic Ocean have been analyzed. 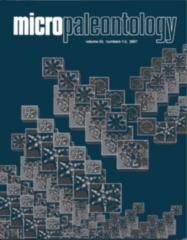 We have compiled Scanning Electron Micrographs for an atlas ofmid-Pliocene assemblages from the NorthAtlanticwith descriptions of each taxon to document the taxonomic concepts that accompany the PRISMdata. Inmid-Pliocene assemblages, the geographic distributions of extant taxa are similar to their present day distributions, although some are extended to the north. We use the distribution of extinct taxa to assess previous assumptions regarding environmental preferences.